Published: Dec. 13, 2012 at 05:11 p.m. Updated: Dec. 13, 2012 at 10:02 p.m.
2012 surely has been the toughest year of Andy Reid's personal and professional life. If the Philadelphia Eagles do the expected and fire Reid after the season, it would make a lot of sense if he took some time away from the game. That's just not how he's wired. In a conversation with Michael Silver of Yahoo! Sports, Reid made it clear that he doesn't plan to spend any time off from the NFL. "That's not where I'm at," Reid said when asked about a potential sabbatical. "No. Listen, I'm a coach. I don't hide that from anybody. This is what I do. And I enjoy doing it. I love every day of it. I sure like winning more than losing, but I also am very privileged to be a coach in the National Football League." Reid has done a nice job righting the Eagles' ship with Nick Foles at the helm. Their effort improved in Dallas two weeks ago, and they pulled off a scintillating comeback in Tampa last week. Reid was as fired up at the end of that game as we can remember. Foles has a lot of potential. This is not a coach who looks like he wants a rest. 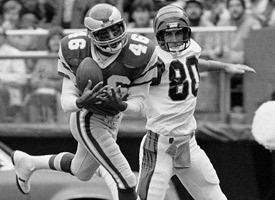 Check out the best photos of Bengals vs. Eagles matchups through the years. "No, I've got the energy," Reid said. "The energy is there. Listen, you'd have to talk to people around me. I'm not gonna sit here and ... you know how I am. I keep my energy level up. I enjoy what I'm doing." "After his son died, I thought maybe (he needed a year away)," Eagles tight end Brent Celek told Silver. "But he's still really into it. He wants to win a world championship. Not only does he want to win one, but he wants to win one in Philly." We can't imagine the Eagles retaining Reid, although crazier things have happened. There has been a lot of speculation that Reid would like to land in San Diego, but it's an awkward fit. NFL.com's Albert Breer reports that Chargers director of player personnel Jimmy Raye will take over the team's operations. Reid isn't going to want to work under Raye or anyone else. But he surely will be working somewhere.